Investors should take note that Scotiabank conducts their reviews AFTER issuing a target price. In an explanation that sounds like the kind of thing you’d hear from a guy trying to explain to his wife why he’s been texting his secretary so frequently, and so late at night (“honey, you just need to understand our relationship in the proper context!”), Scotiabank points out that the $280 million that Hindenburg tallies for the deals in question got some help from the market gods. Valued at transaction time, APHA bought those assets (from directors and affiliates) for a figure closer to $145 million. Scotiabank’s research report undoubtedly cast Aphria’s LATAM dealings in a favorable light. 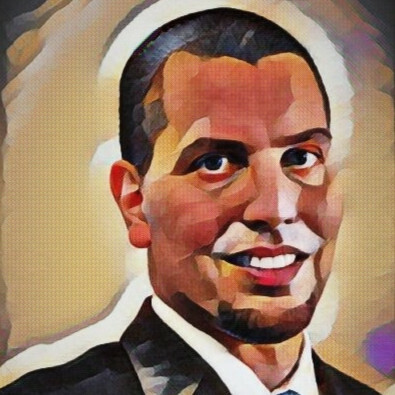 It has uncovered further portrayal of bias—which is describes as not “fully contextualized” with respect to Aphria’s purchase of LATAM Holdings—and brings into question how Hindenburg erroneously came to valuation conclusions. Which is kind of rich coming from a guy who never seems to run out of good things to say about Aphria. 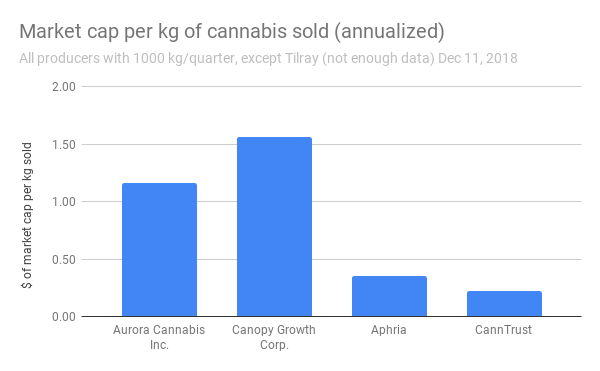 [The fact taht APHA insiders cleared $4M from their undisclosed positions is] somewhat eye-opening from a superficial perspective, a more advanced view of the facts clearly indicates that Aphria insiders did nothing wrong. For starters, Aphria insiders were under no legal obligation to disclose such information, as they were neither material (a combined 0.9 per cent of Nuuvera stock was procured on a fully diluted basis) and were held in escrow to prevent selling into the open market. The Nuuvera shares would later be converted to Aphria stock, and subject to blackout trading restrictions. The transaction was later reviewed by the Ontario Securities Commission, who found nothing wrong. According to the OSC, the takeover of Nuuvera was deemed an arms-length transaction, and as such, “would typically not be disclosure of shares held by insiders of the acquirer,” stated organizational spokeswoman Kirsten French. Furthermore, Aphria made sure the Nuuvera acquisition was transparent throughout. The board appointed a special committee of independent directors, which solicited a fairness opinion from Cormark Securities Inc. and outside counsel to advise on the adequacy of the deal. The end result: The board received the special committee’s unanimous blessing to approve the deal—despite the personal interests involved. Aphria shareholders would later grant the same tacit approval. You get all that? They didn’t HAVE TO disclose, so they didn’t! And the firm they hired to do a fairness opinion didn’t say anything about the position they didn’t disclose, and it all converted to stock and got added to their pile anyway! It’s subject to a blackout! Hindenburg’s followup post Dec. 4th pointed out that Cormark, hired to do the fairness opinion, clears a lot of fees doing Aphria underwritings. We wrote yesterday that APH is going to have to go through a management change to regain the trust of the street before it sees the same kind of market valuations its peers get. But the company seems determined to use the same sell side firms and bullhorn blogs who helped them get to this valuation in the first place to convince us all that Hindenburg’s smash-and-grab job is just a distraction. That there’s nothing wrong with a bit of honest graft, and we’re as good with the crooks at Aphria as we are with the crooks at the other big 3. Vic Neufeld has promised a line-by-line rebuttal to the Hindenburg report, and you’d better believe The Midas Letter will have it as soon as it drops. 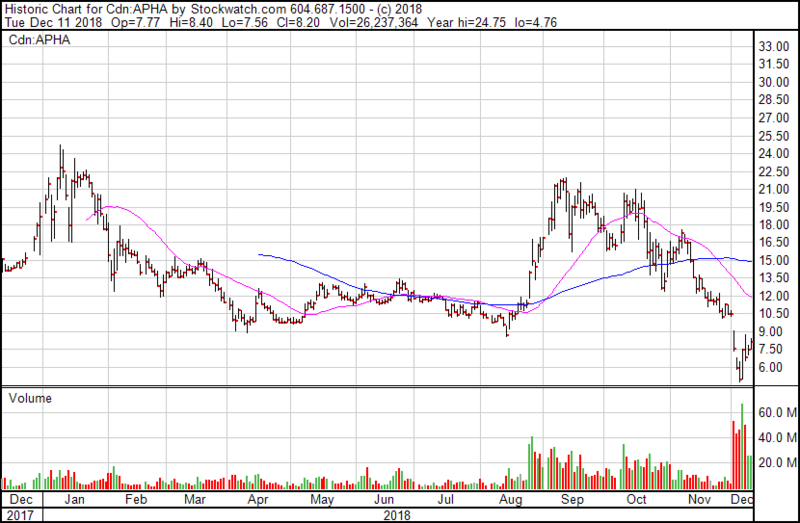 Aphria longs are lucky that they’re being targeted by opportunistic short sellers, instead of an activist firm. At least so far. Hindenburg’s initial strike put some blood in the water, and if any activist shark is inclined to be involved in this low-revenue, high-potential cannabis space, it definitely got their attention. If the forthcoming line-by-line response doesn’t put some confidence back in the street, we’ll likely hear from activists who care about cannabis. They’ll try to buy what Aphria has built at a management distrust discount, and it could get hot and messy. But for now, it looks like Aphria management is going to have to be dragged away kicking and screaming. APHA is on the mend right now, closing today at $8.20 on 26 million shares. We expect the company to under-perform the sector until management either convinces the street to forget about this or leaves.